In the past three years a group of supporters of Dorset and Somerset Air Ambulance (DSAA) have raised over £67,000 in support of the charity. The Team o’ Tumblers from the racing and hunting community decided unanimously to support the Dorset and Somerset Air Ambulance by entering a team into the charity’s Coast to Coast Cycle Challenge. For some, it was not only the challenge of getting themselves fit and being able to cycle 54 miles, it was also about bringing themselves to wear Lycra and padded shorts. In the spirit of the challenge and in a bid to raise as much as possible, many a MAMIL (Middle Aged Men/Maiden in Lycra) has since joined the enthusiastic group. 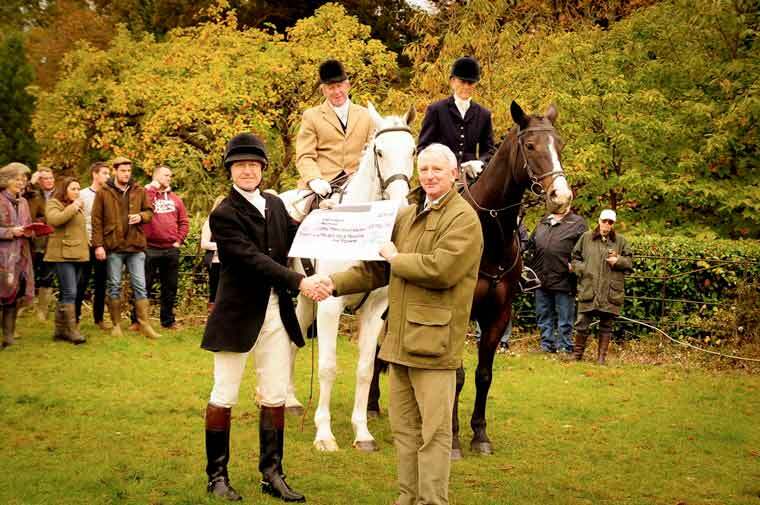 A cheque for £67,734.90 for DSAA was presented recently. Rupert Rees, spokesperson for Team o’ Tumblers said: “If you ride horses, you are inevitably going to suffer a fall at some point; but very often this is in some remote field miles away from anywhere. “We absolutely love supporting Dorset and Somerset Air Ambulance and believe they are such a wonderful charity. All sorts of people from the hunting and riding community, mostly with no particular cycling experience have joined Team o’ Tumblers over the years and we have all thoroughly enjoyed the fund-raising experience. Bill Sivewright, Dorset and Somerset Air Ambulance chief executive officer was delighted to attend the presentation and said: “We are extremely grateful for the long term support of Team o’ Tumblers and it was particularly nice to be able to acknowledge the tremendous efforts of the cyclists and the incredible amount of funds they have raised over the last three years. More information about the DSAA can be found by visiting: www.dsairambulance.org.uk or by calling: 01823 669604.